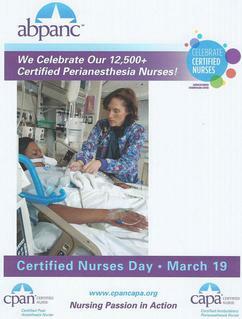 on Certified Nurses Day * March 19, 2018.
from flyer below or at cpancapa.org. We are proud to have 8 certifications Coaches from our Ohio Component. I am a Certification Coach from NOPANA and this is my contact information: Debbie Wilson, MSN, RN, CPAN; Educator-AAP, Preop Holding, PACU; Promedica Toledo Hosptial; 419.291.5533 (office) 419.479.6082 (fax). Other Coaches in Ohio include; DAPANA - Brandy Mather, BSN, RN, CPAN, CAPA; GCPANA - Lisa Mayell, BSN, RN, CAPA; GCPANA - Catherine Prince, BSN, RN, CPAN; DAPANA - Teresa Salley, MSN, MS,RN, CPAN, CAPA; NEOPANA - Victoria Wells, MSN, RN, CAPA; COPANA - Alabelle Zghoul MSN, RN CPAN - Jacqueline Knauff, BN, CAPA; CAPANA. Contact a coach with any questions or assistance you may need on your journey to your CPAN and CAPA certification. If you are already certified, encourage your colleagues to join the 12,500 perianesthesia nurses who are CPAN or CAPA certified. There are many benefits for improving your knowledge of our nursing specialty, advancing your own career, and improving patient care. Current" News to share" for CPAN/CAPA Certification. ASPAN Members receive $100.00 Discount by being members so join today ! This approach allows you to study at your own pace, earn 8.1 contact hours, and face the certification exam with greater confidence. Additionally, the bundle can be purchased with or without the latest version of the Perianesthesia Nursing Standards, Practice Recommendations and Interpretive Statements, another great resource for preparing for the exams. Special member pricing is available!  You will have access to each individual module for 30 days from date of purchase, and to the six-module bundle for 45 days.  Individual Modules: $25 each for ASPAN members; $40 for non-members.  Perianesthesia Certification Review Bundle: $98 for ASPAN members; $160 for non-members.  You must be logged into the ASPAN Website to continue. If you are not already logged in, click here to log in, or to create a user name and password.  If you experience any difficulties viewing a Webinar Module, please click here for recommended computer standards for optimum viewing. and/or to view your previously purchased modules. The Perianesthesia Certification Review Seminar bundle is a great resource for starting your review for both the perianesthesia certification exams (CPAN® & CAPA®) offered by the American Board of Perianesthesia Nursing Certification. A "Learner Paced" educational activity, you can take your time and review each module at your convenience. However, stopping a module and leaving the page will result in uncompleted modules restarting from the beginning. The Perianesthesia Certification Review Seminar bundle can be purchased with or without a copy of the ASPAN 2017-2018 Perianesthesia Nursing Standards, Practice Recommendations and Interpretive Statements. ASPAN Members receive a $10 discount on Standards with bundle purchase. to help you study more efficiently. Study Tips – This electronic document provides valuable study tips to help prepare for the computer-based testing model. Study Plan – This study plan divides subject matter into topics based on the CPAN and CAPA test blueprints.